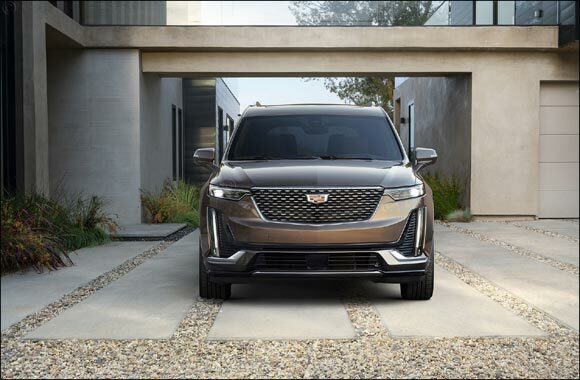 Dubai, UAE, January 14, 2019: Cadillac expands its popular crossover and SUV lineup with today’s global debut of the 2020 XT6. Created to make the most of passengers’ time on the road, this all-new three-row crossover centers on a luxurious, adaptable and connected cabin, complemented with responsive handling and a comprehensive suite of standard and available safety technologies. Every inch of the XT6 has been carefully considered and developed to offer a refined, comfortable place to connect and enjoy the ride. XT6 offers a comprehensive suite of standard and available driver assistance and safety technologies1, along with generous cargo capacity. The latest Cadillac user experience, with intuitive controls including a rotary controller with new jog functionality. Premium Luxury and Sport models offer customers more customized looks with unique exterior and interior distinction. Nimble, responsive driving experience, powered by a 3.6L V-6 engine and nine-speed automatic transmission, offering up to four selectable driving modes. • Adaptive Cruise Control – Advanced. • NFC phone pairing and wireless charging for compatible phones3. • HD Surround Vision Camera1. • Illuminated Cadillac Crest hands-free liftgate. • Keyless Open and Adaptive Remote Start. XT6 offers a comprehensive suite of driver assistance and safety technologies1 that can help drivers be more aware of their environment. They include sophisticated radar-, camera- and other sensor-based technologies. Further, the vehicle structure is designed to help keep occupants safe, with premium body materials and features such as boxed, splayed front rails and a state-of-the-art restraint system, including seven standard airbags. Thoughtful technology integration is central to the XT6’s mission of offering a seamless and intuitive in-vehicle experience. It elevates connectivity to a new threshold for Cadillac, with some of the brand’s most advanced features. • Personalization — user profiles stored in the Cloud6 allow customers to access their custom profile in other properly equipped GM vehicles. • Updated navigation7 functionality with natural address entry. • Capable of supporting SiriusXM 360L. • 4G LTE Wi-Fi® hotspot (includes 3GB or three months of data, whichever comes first)8. • Apple CarPlay9 and Android Auto10 for compatible smartphones. • Next-generation, 15-watt wireless charging3. The foundation for the XT6’s expressive design is its strong proportions, with distinct personas for the Premium Luxury and Sport models. Bright Galvano exterior accents distinguish the Premium Luxury model, while the XT6 Sport is defined by darker accents and more aggressive, performance-inspired details, including available 21-inch wheels. Both models feature advanced lighting technology, including vertically emphasized LED signatures. Two headlamp variants are offered: a standard bi-function LED projector design or an available, performance LED headlamp system with a three-element projector array. driver confidence. Those qualities are uniquely distilled between the Premium Luxury and Sport models, with a greater emphasis on road isolation in the Premium Luxury and a greater feeling of agility dialed into the Sport’s chassis tuning. Customer-selectable drive modes allow the XT6 to adapt even better to driver preferences and changing road conditions. The modes are uniquely calibrated to support the characteristics of the Premium Luxury or Sport models. AWD is available on Premium Luxury and standard on XT6 Sport. The Sport model features a Sport Control active twin-clutch AWD design that helps enhance the driving experience with active yaw control. Sport models also feature Continuous Damping Control active handling and a faster steering ratio that is tuned to support a more enthusiast-level driving feel, with increased feedback and greater overall responsiveness. The XT6’s sophisticated driving dynamics are powered by a 3.6L DOHC V-6 engine estimated at 310 horsepower (231 kW) backed by a nine-speed automatic transmission featuring next-generation Electronic Precision Shift. To enhance fuel efficiency, Active Fuel Management technology enables V-4 operation when V-6 power is not required. The 2019 XT6 makes its public debut at the North American International Auto Show Jan. 14-27 in Detroit. It will be manufactured in Spring Hill, Tennessee, and available for ordering this spring. Pricing and additional information will be announced closer to the start of production.